Welcome to Giveaway Day! For the handmade category, I'm giving away this cute rag doll. I named her Penelope, but you can name her whatever you want! She's a little bit feisty and very sassy in her chevron tights and grey dress. I made her using the rag doll tutorial I put together. 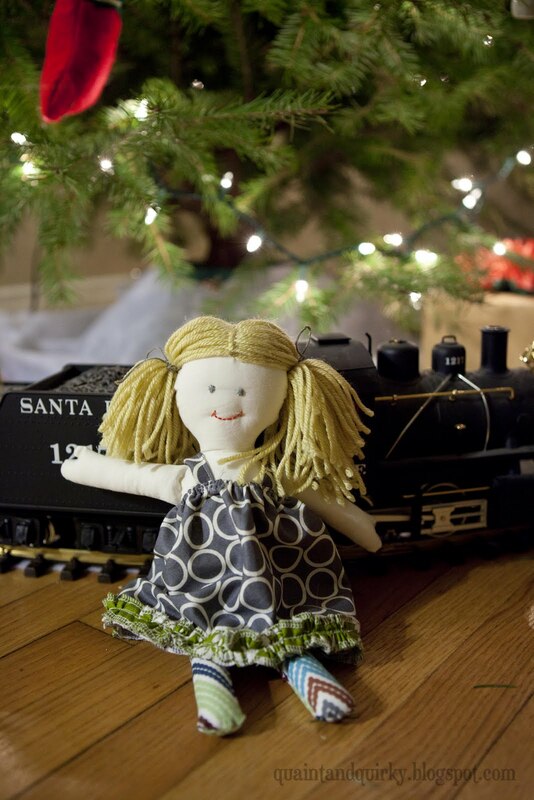 Rag dolls are a great last minute gift idea. Not that December 12th qualifies as last minute. Noooooo! Watch out! She likes to have fun! To win her, leave a comment. Tell me what your favorite childhood gift was. If you are already a follower or choose to follow me today, leave another comment telling me that you did so. The giveaway will close Friday, December 16th at 5PM PST. I will ship to theUS or Canada. Visit my Gift Certificate Giveaway HERE. My daughter would LOVE this doll! My favorite childhood gift would have to be my really nice Minnie Mouse watch when I was about 8 - it was my first "grown up" present ;) Thanks for the chance! What a sweet doll! One of my favorite childhood gifts was a bear my mother made me. She wore a fancy dress and was named Princess Penelope. I'd love to share a new Penelope with my niece. my favorite gift might have been the fake cabbage patch doll that my mom made for me... loved her to pieces, literally! My favorite gift as a child has to be a rag doll from my Grandma when I was seven. My daughters would love this doll and I'm pretty sure they would keep Penelope as her name! What a sweet doll! My grandma made me a rag doll with a carrying bad that folds out into a flower. I loved it so much and I still have it! I went searching for the pattern and if you can believe it, a reader of mine had one, from 25 years ago and sent it to me. :) How amazing is the blogging world? Probably my Strawberry Shortcake doll house! I LOVED that thing and I remember how VERY excited I was when I saw it under the tree! Fave gift I received as a child was a large brown plastic hutch with a pink tea set. I think my favorite childhood gift was an art set in a case, where everything lined up nice and neat and in order. I used it for years. Aww, Penelope is so sweet! My favorite childhood gift was my sweet stuffed dog from my grandma. It was hers as a child, and I still cherish it! Thanks for the sweet giveaway, and Happy Holidays! I loved dolls when I was little, actually I still do love them. I remember the year I got a Rainbow Brite doll for Christmas, I don't think that doll left my side....until I left it near the fire place and she melted. I was heart broken. Favorite childhood gift was probably a dollhouse! I loved those hershey kiss candy canes we got one year! What a sweet dolly. my favorite gift I received as a child was a dollhouse my dad and grandpa made. I loved everythin Mickey Mouse as a kid! What a great doll...hope I win it for Ruthie!!! I got a Barbie mansion one year and I was in heaven! Cute doll, thanks. she is darling! 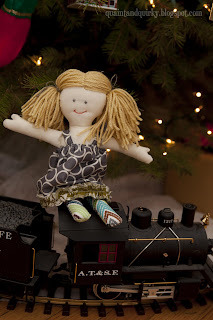 my little girl would give her a great home :) my favorite gift was a red headed cabbage patch doll named morgana darlene. i wanted her soooo bad and was thrilled to open her on Christmas morning!! Darling my little would love this! My favorite was a stuffed little foot dinosaur from my grandparents. We traveled every Christmas in lieu of presents and it was the best gift I could have EVER gotten. I have deep memories of where I was and what we did for every year of my childhood ! That is a sweet doll and my little girl would love her. I loved getting art supplies as a child. Thanks for the great giveaway, I can't wait to check out your tutorials. My favorite gift was my first ever big girl bike! t was 2nd hand, but it was such a surprise and I was so happy with it! What a darling little dolly! My favorite childhood gift was a wood shelf with a heart cutout on it that I kept all my special little trinkets on. Thanks for the chance to win! My favorite childhood gift was for my 12th birthday...a pink walkman! Man, I wanted that thing so bad, and my stepmom put together a scavenger hunt to find it. I didn't even know what I was getting, and I was so excited to see that! such a sweet doll :) I remember most when I got an old school Nintendo! My favorite gift was a pair of ice skates! My favorite gift growing up had to be my banana seat bike. Oh, Penelope is just beautiful! My favorite gift as a child was my Strawberry shortcake dolls collection. I received it on my sixth Christmas and was admitted into the hospital that same morning. I stayed there for 2 weeks. I am happy now to have great health and I still have the entire collection + fond memories. My favorite gift as a kid was a set of "real" artist pens. My Cabbage Patch dolls were among some of my favorite childhood gifts. Oh, I'm one of your followers. And I have no idea what my favorite gift was. Isn't that pitiful? I don't remember anything in particular. Have a wonderful Christmas! My favorite childhood gift was my Velvet doll that my aunt gave to me. She has adjustable hair! Thanks for the opportunity to win! Merry Christmas!! My favorite gift as a kid was my very first sewing basket, complete with accessories and notions. I was able to pass on almost all the included tools to my daughter this past year to start her out on her first sewing basket. I had my first one until just last year when we moved...so it stayed with me for nearly two decades. I can't really remember a favorite gift, but somewhere along the line my grandfather gave me a bear puppet that I named Beaver. He now keeps watch over my daughter every night, so I suppose I have to call him my favorite gift even though I don't remember receiving him (it's like he's always been there:). Thanks! She is adorable! I don't remember this, but we have a video of me when I was two getting very excited about getting a popple for Christmas. Thanks for the chance to win! ryansarahn at gmail dot com. She is adorable! I LOVE rag dolls. And my favorite gift would have to be a pair of 60 type pants. What a sweet doll! Thanks for the chance to win!! My favorite gift was my strawberry shortcake baby doll. She blew kisses that smelled like strawberries. In fact, she still does! I got a record of the Super Bowl Shuffle when I was 6 and it was AMAZING. One Christmas my brother and I woke to find a huge pile of cardboard brick blocks from Santa - it stuck with me so much that we did the same for our kids a couple of years ago. They still play with them every Christmas! What a darling doll! My favorite gift as a child was my first real dollhouse. My favorite childhood gift was a barbie - she went from day to night with reversible clothes. So embarrassing! My favorite childhood gift was a teddy bear that I just loved and still have named Theodore. Love the giveaway! my fave childhood gift was a bike and a barbie perfume maker... I got them the same year... and used them both a lot!!! loved them!!!! THanks for a great giveaway! My favorite was Barbie clothes, way back when Barbie was first invented. I had a single mom, and we were poor, really, really poor. She came home after work and made my sister and I each a big collection of Barbie clothes. We may have been the poorest kids in class, but we didn't know it. Every single girl in class was jealous of our great collection! When I was 10 I finally got my very own bicycle. That was the longest winter ever! I had to wait until the snow melted before my Mom would let me ride it! This doll is so cute. My favorite childhood gift was an old Barbie doll from my parents. It was at a local antique shop and I looked at it every time we were there. I was so sad one day when it was not there any more but later found out that they had bought it for me. My late sister and I had Tammy dolls as a gift one Christmas. We took them swimming (the bathroom sink), sat in their living room (we made with matchboxes, spools, roofing metal, and other found objects). Lots of imagination with the poor people's version of a Barbie. Penelope's a cutie and whispered in my ear she wants to come to Texas!! The best gift I received as a child was a Blue Schwinn bicycle. We were pretty poor growing up and our next door neighbor bought a pair for me and my sister. Sweet! My "My Child" Doll. It still sits on my dresser! My most memorable childhood gift was a Sasha doll that was wearing a dress my mom had made to match the dress I was wearing that Christmas day. I thought it happened by magic! Merry Christmas! my favorite gift was the year we got a basketball goal. All three of us were so excited! Had to be the swatch. Anyone else remember those? Favorite childhood gift was probably my banana seat bicycle. I just wish my parents would have kept it. Thanks for the chance to win. Oh she is so sweet! My daughter would love her. Hmmm...a favorite childhood gift was probably my Cabbage Patch doll. Thanks for the chance! One of my favorite presents were Hit Stix (go 80s/early 90s) I was so excited to get them, but they didn't work long. Another favorite was a doll that you got without knowing if it was a boy or girl (and there was a possibility of twins). Thanks so much for the great giveaway!! My granddaughter would love that! Favorite holiday gift was trip to disneyworld. My favorite was the Fisher Price "doll" house my Grandpa made me. The rooms, doors, and furniture were all designed to work for Fisher Price people.